According to Yahoo Sports and interview with Peter King on Sunday Night Football, sources say Michael Vick will likely be suspended this week or next by commissioner Roger Goodell. Personally, IF he had any involvement what so ever in these dogfighting rings, I am glad he is getting suspended. 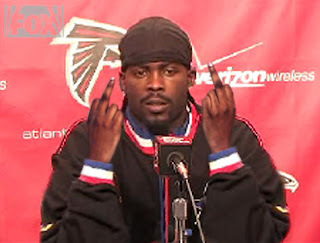 Vick, T.O and other "I" team players should all be traded to one team where they can all complain to eachother. Here is the link to the original story on Yahoo! Sports. Although there is not much more to the story there.